*Configurable as a 1 loop panel, up to 324 addresses. *Windows/ Excel-like friendly user interface combined with keypad, mouse, key switch and USB port make operation convenient. 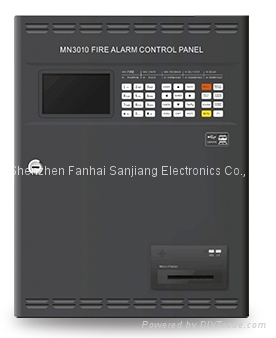 *Flexible distributed network capability, up to 20 sets of MN3010 can be interconnected. *Non-polarity two-wire bus makes cabling easy and avoids mistakes.